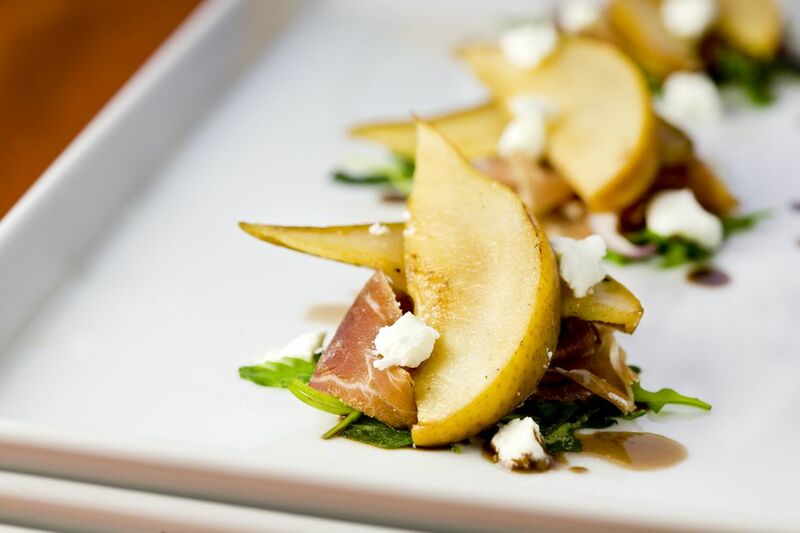 Pears, like many other fruits, partner well with salty prosciutto. Broiling the wrapped pear wedges crisps the prosciutto and softens the pears just slightly. While you don't have to use a high-end, expensive balsamico, avoid the cheap supermarket varieties and splurge on a brand that's aged (you can tell by how thick it is). As a short-cut, you can simply drizzle a good aged balsamic over the pears. But to take it to the moon, take the time to make some candied balsamic drizzle. An additional option would be to sprinkle them with some crumbled blue cheese. Peel and core the pear. Cut it into 6 to 8 wedges (depending on the size of the pear). Cut the prosciutto into strips (enough that you have 1 strip per pear wedge), and wrap each piece of pear with a strip of prosciutto. Place on a small rack over a sheet pan. Heat the broiler in your oven and place the rack close to the element. Broil the pears for 2 to 4 minutes, until the prosciutto is beginning to crisp up. Turn the pear wedges over and broil the other side for another couple of minutes. The balsamic candy drizzle can be made a few hours in advance and slightly rewarmed right before adding to the salad. Add all three ingredients to a small pan and bring to a soft boil. Whisk vigorously once at a boil and reduce to medium-low heat. Continue to whisk often as the sauce reduces to half its original amount. Taste along the way and add a little extra sugar if you'd like. The reduction process may take a half hour or more. Be patient—it's worth the wait. These can be served warm or at room temperature. Just before serving, drizzle with a few drops of the aged balsamic vinegar or the balsamic candied drizzle. If using, add a little crumbled bleu cheese on top of the balsamic.